When I think of the warmer months, one of my favorite flavor combinations is pineapple and coconut. Today’s recipe for No-Bake Tropical Cheesecake Bars features both of these quintessentially-summer fruits. This treat also features the classic crunch & timeless taste of NILLA Wafers both in the crust of these bars and as a garnish in the cheesecake topping. With the Fourth of July coming up, these Tropical Cheesecake Bars are the perfect treat to take your celebration up a few notches! If you love summer & enjoy making delicious, easy-to-prepare desserts, then this recipe is a must-try! When the temps heat up during spring & summer, one of my pet peeves is turning on the oven and thereby heating up the whole house. That’s another reason why I love this recipe for Tropical Cheesecake Bars… they’re no-bake so they are super easy to whip together! Before I get to the recipe details, I have a fabulous sweepstakes to share with you all today. Prizes include one $200 Walmart Gift Card Grand Prize and six $50 Walmart Gift Cards. Enter between Tuesday, May 15th and Thursday, July 5th. Please note that I-C will randomly select winners from all program entries and will facilitate fulfillment of the winning prizes (7 winners). Now, let’s get to the recipe, shall we? 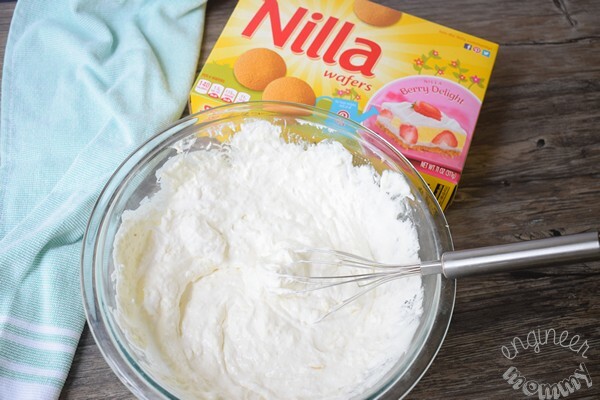 Start by gathering the ingredients: NILLA Wafers, sugar, frozen whipped topping, crushed pineapple and coconut oil. For the full recipe details, scroll down to the recipe card. 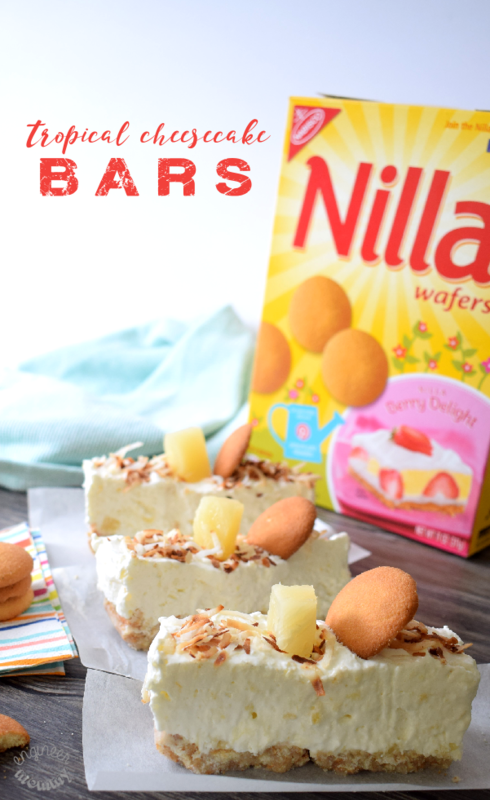 I love that NILLA Wafers are so versatile – their delicious flavor is the perfect starting point for so many no-bake summer recipes! To make the bottom crust for these bars, combine crushed-up NILLA Wafers, sugar and coconut oil. The desired texture is similar to that of wet sand. 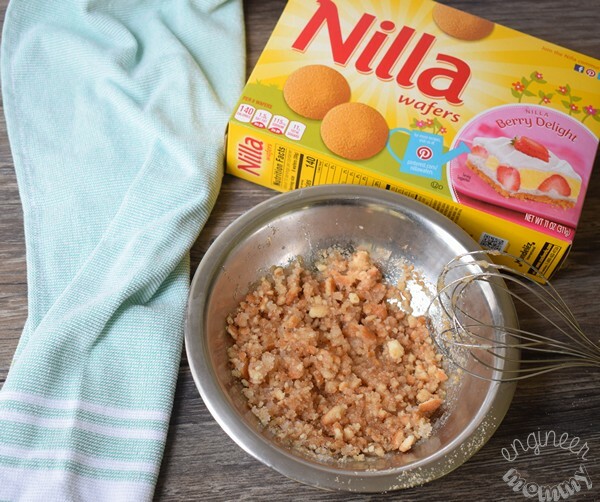 *TIP: To crush the NILLA Wafers, you can place them in a food processor. Alternatively, you can place them in a sealed zippered plastic bag and use a rolling pin to crush them. Once the crust mixture is combined, pack it down into a freezer-safe container lined with parchment paper. The parchment paper will make it much easier to remove the frozen bar for neater slicing. Now it’s time to prepare the cheesecake filling. Combine the frozen whipped topping, cream cheese, sugar, and crushed pineapple. Use a whisk to fully combine. Pour the cheesecake mixture on top of the crust layer. Place in freezer for at least 2 hours to firm up. Once firm, remove from freezer. Gently pull up the sides of the parchment paper and the whole thing should come out in one piece. Slice into bars. Now it’s time to decorate the bars- always my favorite step! Top with toasted shredded coconut, one pineapple chunk and a NILLA Wafer! 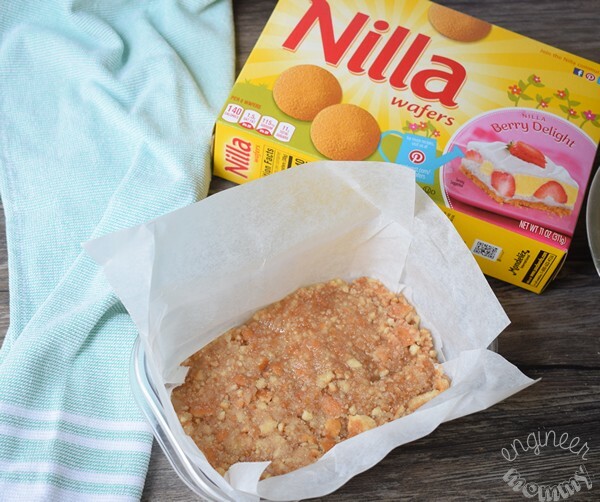 I love that NILLA Wafers are a quick, delicious solution for hot summer days! 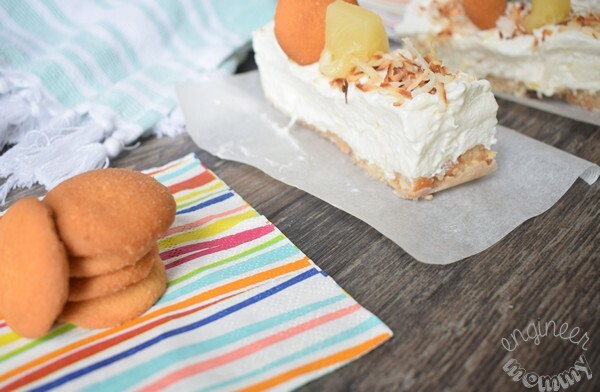 These Tropical Cheesecake Bars are a delicious combination of flavors: crunchy NILLA Wafers, creamy whipped topping, tart pineapple and sweet coconut. In fact, this treat is a delight for the taste buds! 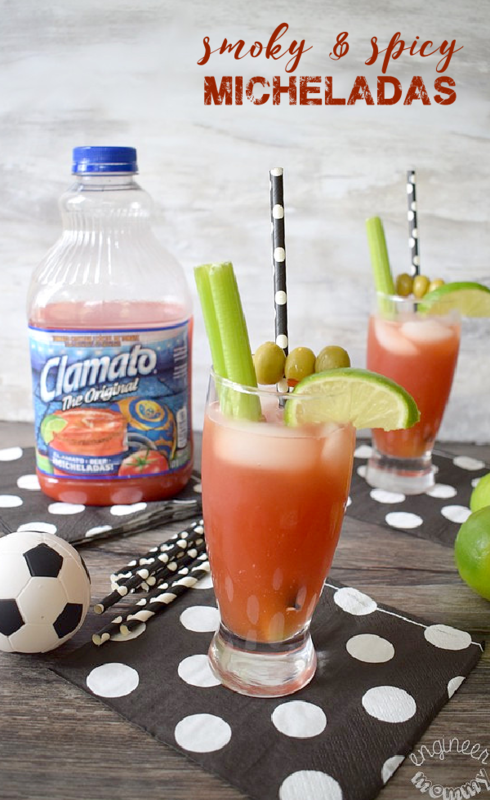 Perfect for your July 4th parties & gatherings! These bars are perfect for summer parties & gatherings. 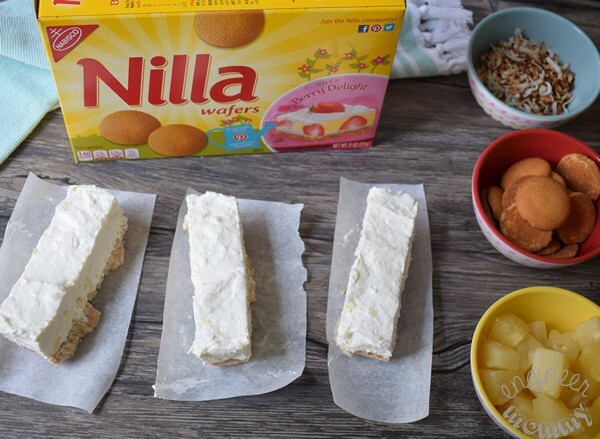 If you’re looking for even more inspiration for no-bake recipes featuring NILLA Wafers, be sure to click here. Celebrate summer with NILLA Wafers this year. The possibilities are endless for all your dessert needs! Want to see a video tutorial of how to make this recipe? Watch this! Look for both NILLA Wafers and NILLA Lemon Wafers at your local Walmart store for all your summer entertaining needs. I picked up both on a recent trip to Walmart. 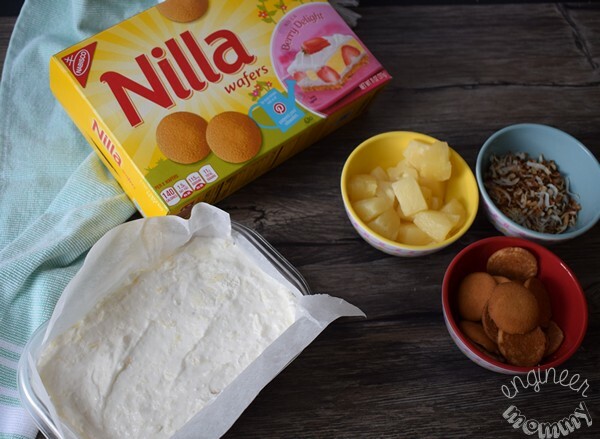 The classic NILLA Wafers are delicious & pair well with so many foods, making them a versatile ingredient for so many dessert recipes. 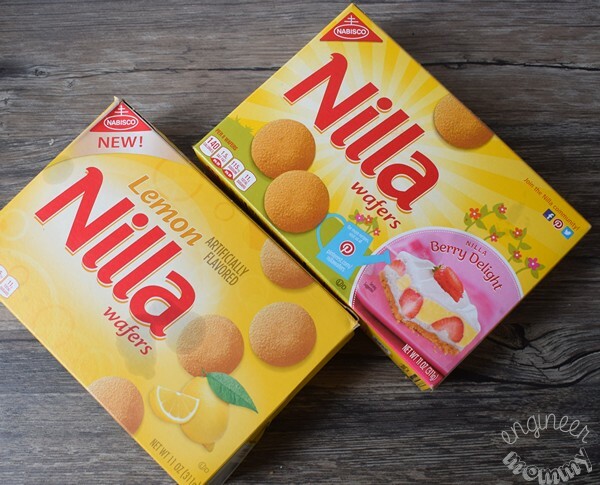 The NILLA Lemon Wafers offer a bright, citrusy flavor that is perfect for adding a little zing to your favorite summer recipes. 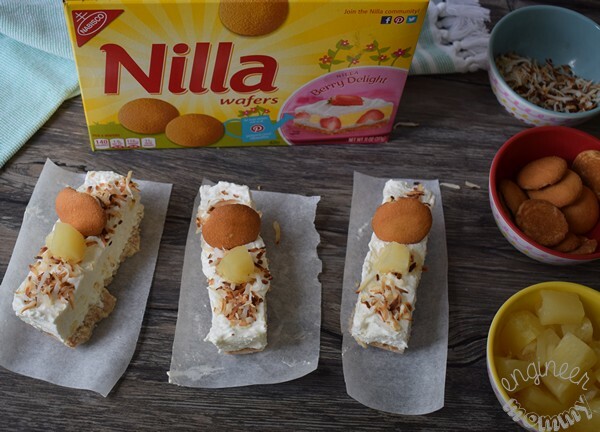 Whip up a party this summer with NILLA Wafers. 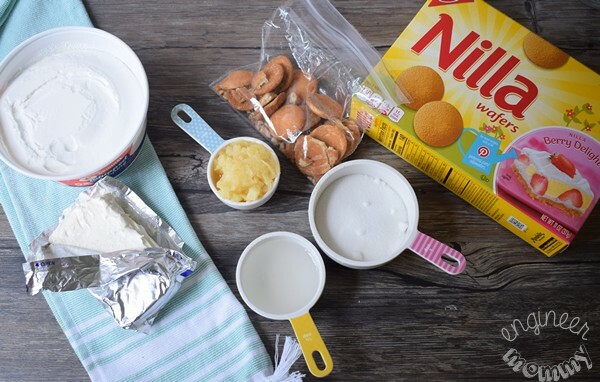 Make these delicious Topical Cheesecake Bars for your July 4th celebrations and be sure to click here for more no-bake dessert ideas featuring NILLA Wafers. What is your favorite way to enjoy NILLA Wafers? 1. Combine the ingredients for the crust in a mixing bowl. Pour into a loaf pan that is lined with parchment paper. 2. Combine the ingredients for the filling in another mixing bowl. Pour on top of the crust layer. 3. Place the loaf pan in the freezer for at least 2 hours to firm up. 4. Once firm, remove from freezer. Pull up the parchment paper and the bar should come out in one piece. Slice into bars. 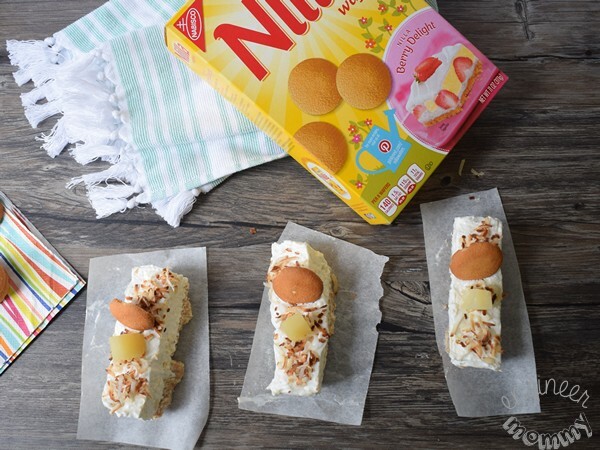 Optional: Garnish with toasted coconut flakes, pineapple chunks and NILLA Wafers. Pineapple and coconut are two of my favorite summer flavors as well so I know I’m going to want to dive into your tropical cheesecake bars. They look so good! 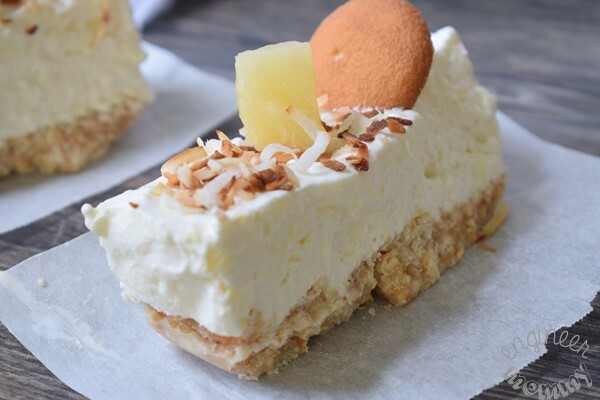 We enjoy the taste combination of pineapple and coconut and we never turn down pie. Using the vanilla wafers for the crust is a classic move and works well with this kind of pie. Those tropical no-bake cheesecake bars look delish. Though it’s my first time seeing those specific products, they look tasty. This looks delicious! Huge fan of of pineapple, can’t wait to give this recipe a try. Would be perfect for my next family gathering. You mean that I can make a delicious treat and And not have to turn my oven on! I am definitely on board with this! It looks delicious! You had me at cheesecake but then you added tropical and that got me more excited and then the vanilla wafers and my heart just sang – yummy. These look simple and yummy! I am saving this recipe! Yay, so glad you like this one! Let me know how they turn out for you! I love no bake desserts! I’ll be trying these over the summer. I love when I can use Nilla wafers. They are some of my favorite cookies. Those nilla wafers are versatile for sure. This looks like a very tasty treat and I do like the bar form making them easier to eat. Yes, thee bars are so fun! Perfect for a July 4th party!! These look so delicious and I love the added pineapple to the recipe. These would be perfect to make for a barbeque during this summer! Oh my goodness this sounds absolutely delicious – I have to admit I have a bit of a softspot for all things cheesecake and this sounds extra delicious. This sounds so good. I am always a sucker for a good no-bake cheesecake recipe and this one looks delicious. Cheesecake is always a hit with my family!! Hope you try this too! Oh my gosh, those look amazing!!!! This looks delicious! My husband loves cheesecake. 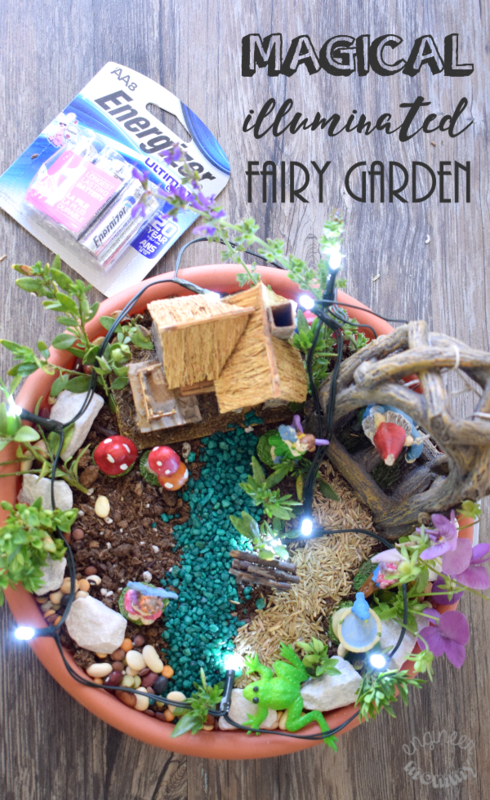 I bet he would love it if my son and I made it for him for Father’s Day. I am always looking for no bake desserts for summer. This has so many wonderful flavors that my family loves. This is going into the “to try” file. Great, Ellen! So glad you like this recipe! I would love these, and I especially love the idea of letting everyone choose their own toppings. I do not like coconut, so this would be huge for me! I am so doing this cheese cake since I have all the ingredients. I am not fond of baking so when I find recipes like this that doesn’t involve baking, I am for it. I’m all for no bake desserts! And you can count me in for anything including Nilla Wafers. They are amazing!